Directions: Look for a very long gully on the right side of the ravine, just left of North Gully. Description: The longest climb in the ravine. It contains lots of good snow climbing and one or two interesting ice bulges. Be careful of the bulges as they can contain ice dams. It can be avalanche prone in high-snow years. 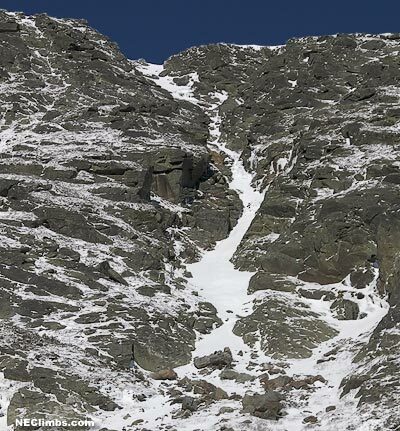 Pitch 1: Climb multiple pitches of snow and moderate ice to the Alpine Garden. History: January 31,1943 - William L. Putnam, Andrew J. Kaufman did the first complete ascent, but Robert Underhill and Lincoln O'Brien came close in 1929.